Fruitless Pursuits: Review: Men in Black III : Black Harder. Note: Do not confuse this film with Men in Blacks 3. Especially if you have your kids with you. 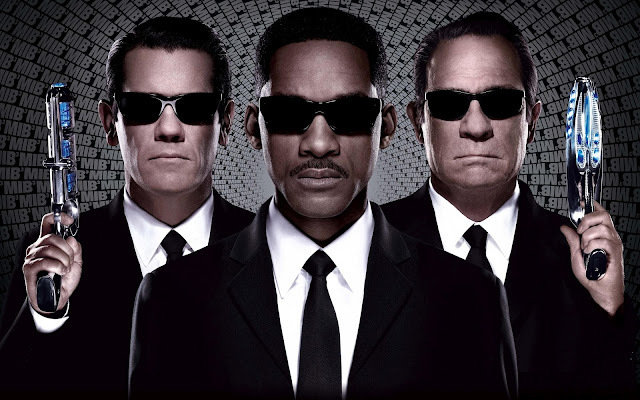 Director Barry Sonnenfeld's belated threequel Men in Black 3 is an inventive, quirky, sci-fi action-comedy with a hell of a lot of promise. And then Will Smith and Tommy Lee Jones show up. To find out what they got right and what went wrong... join me after the jump! To be fair, I really enjoy Men in Black as a concept and have sincere fondness for the look, the soundtrack, the gadgetry, and the absurd alien mayhem that the premise allows. I think, on the surface, a third Men in Black is a sound idea but I really think it would have benefited from a straight out reboot. Wipe the slate clean, give us two brand new up-and-comer agents to focus on and relegate J and K to cameos if you have to have them at all. Because when there are fresh faces on the screen the whole film comes alive. Flight of the Conchords' Jermaine Clement is the highlight as gross alien villain Boris the Animal and, for me, his opening escape from a maximum security prison on the moon is as good as this film gets. His character design is clever and cringe-worthy, unique and memorable, and Clement looks to be having just the right amount of fun, amping his character to a dizzying, cartoon menace that is wonderful to watch. Similarly, Josh Brolin as the younger Agent K is note-perfect in his interpretation of deadpan Tommy Lee Jones, and yet there's actually a great deal of nuance and warmth to everything he does. Even the over-the-top Emma Thompson, who has some rather broad and unsuccessful jokes to contend with, pitches the character at the just the right spot, creating a confident caricature that rises to the occasion. So what happened to the film's veteran stars? Tommy is beyond deadpan in his relatively short amount of screen time. He's barely present, even unfocused and... embarrassed? There was a sheepish quality for me, like maybe he'd just seen Batman Forever for the very first time. Will Smith has been absent from our screens for the past four years and it feels like he spent the entire time napping and is just waking up. This is a sleepier, muted Smith who is finally beginning to show his age. Considering his maturity and breadth of roles since the last one it almost feels kind of weird and stunted for him to be still stuck in the, "Hey dog!" "Shiznit!" and "You look like you come from the planet DAMN!" It's hard to look undignified in a slick black suit and sunglasses and yet both Tommy and Will are awkward at times. So what about the story? Well, you probably all know by now that when Boris the Animal escapes from moon-jail he exacts revenge on Agent K by murdering him in the past. This means that Agent J must time-jump back to the sixties to save Agent K, and ultimately the world. The time travel/sixties element of the story, introducing the younger version of K, is refreshing and it has some fun set pieces for the characters to play in. The problem is that structurally the story is mess, and the best scenes are often bookended by some vague water-treading. It's like buying a Lego set from a thrift store without any instructions. It kind of feels like all the pieces should be there but you're not entirely sure if they've been put together the right way, or you're even making the right thing. At times it completely loses momentum like an odd pie discussing/purchasing sequence that grinds the film to a halt. J and K are talking to each other but really talking about nothing. It's almost like a place-holder until we get to the next bit of plot. Similarly some explanations to events are ridiculously shoe-horned. You can almost hear the screenwriters saying, "Well we know we need to get from A to B somehow... why don't we just throw in a joke." When Agent K is erased from the present we get an uncomfortable scene where Will Smith shows up at some poor mother's door and steals the chocolate milk from her young toddler. He then goes back to base and requests more chocolate milk. Emma Thompson then basically deduces, "If you are craving chocolate milk and have a headache then that is a sign that there's been a rip in the time-stream." That's the best solution you could come up with? IN TEN YEARS? There's a strange patchwork quality too. For example Will Smith has a brief scene with Will Arnett as his replacement partner. Except they're against a green screen in an elevator and both have more matte lines than a rancor. Even Arnett looks pasted behind Will as opposed to actually being there. And then is never seen again. It makes me wonder if he was added in post to liven up a lull in the film. Macguffins and deus ex machina rule the film, in fact it may have been easier to turn a neutraliser on the audience to wipe out some of the pricklier bits. Not that I think this type of film is - or should be - focused on logic or tight storytelling. It's more interested in chaotic sci-fi action, and if the key cast members had more charisma they might have even pulled it off. Do I enjoy seeing Will Smith battle a giant fish? Of course I do. It's a great deal of fun. But the movie struggles to keep that pace. There's sadly not as much alien mayhem as the beginning of the film promises. This in fact might even be the lightest of all three in that regard. All that said, the ending of the film is actually quite satisfying, both emotionally and in terms of storytelling and it is a nice wrap to what I assume will be the end (of at least this incarnation) of the series. It's a mess in the middle but it ties together nicely. Whether or not this is worth seeing is probably dependent on how nostalgic you are for the originals. If you enjoy the premise, and you have the time, then it's at least worth a look. Although I don't know if you need to go rushing to the theatres. If Will and Tommy aren't going to put in the effort, should you? Nobody was really ever praying and wishing for the third film in this series, but it wasn't all that bad. I still had plenty of fun with Will Smith and I thought James Brolin's whole impersonation/performance of Tommy Lee Jones, was spot-on and added a whole lot more comedy to the final product. Good review Luke. Thanks, Dan! Overall I am glad I saw it. If they went the reboot route in the future I would definitely give that a shot too. I do have goodwill towards the series even if this one was hit and miss for me. Enjoyed the review. I had been curious about this one, didn't even realise it'd come out! Also, is the fact that Brolin and Jones have tiny child hands explained in the film? NO SPOILERS PLEASE.